The Samburu National Reserve is 100 square kilometers in size and is located on the banks of the Ewaso Ngiro River in the remoter regions of the North Kenya highlands. The adjacent Buffalo Springs Reserve is on the other side of the river. 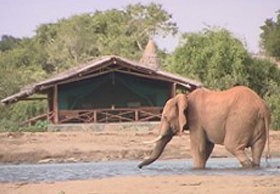 The Samburu Reserve is 600 kilometers from Mombasa. The Ewaso Ng'iro flows through doum palm groves and thick riverine forests and provides essential water for the wildlife from the surrounding arid country. Samburu is the home of Kamunyak a lioness famous for adopting various oryx babies and is also where George and Joy Adamson raised Elsa the Lioness........... made famous in the best selling book and award winning movie Born Free. There is a wide variety of animal and bird life. Several species are considered unique to the region. All three big cats lion cheetah and leopard can be found here as well as Elephant Buffalo and Hippos. Other animals include Gerenuk Grant's gazelle Kirk's Dik-Dik Impala Waterbuck Grevy's zebra Beisa Oryx and Reticulated giraffe. There are over 350 species of bird. These include Somali ostrich grey-headed kingfisher sunbirds bee-eaters marabou stork tawny eagle bateleur vulturine guineafowl lilac-breasted roller palm nut vulture red-billed hornbill Secretary bird Verreaux's eagle owl Superb starling Yellow-billed hornbill and Vultures. The Uaso Nyiro river contains large numbers of Nile crocodile. 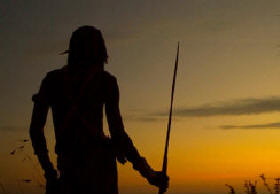 The Samburu are part of the Maa speaking people as are the Maasai. The words of both languages are the same. The name 'Samburu' is also of Maasai origin and is derived from the word 'Samburr' which is a leather bag used by the Samburu to carry a variety of things. Men wear a dress which is often pink or black and is wrapped around their waist. They adorn themselves with necklaces bracelets and anklets like the Maasai. Members of the murran age grade of "warriors" typically wear their hair in long braids which they shave off when they become elders. Women wear two pieces of blue or purple cloth one piece wrapped around the waist the second wrapped over the chest. Women keep their hair shaved and wear numerous necklaces and bracelets. The Samburu believe that their muti-faceted God Nkai is the source of all protection from the hazards of their existence.